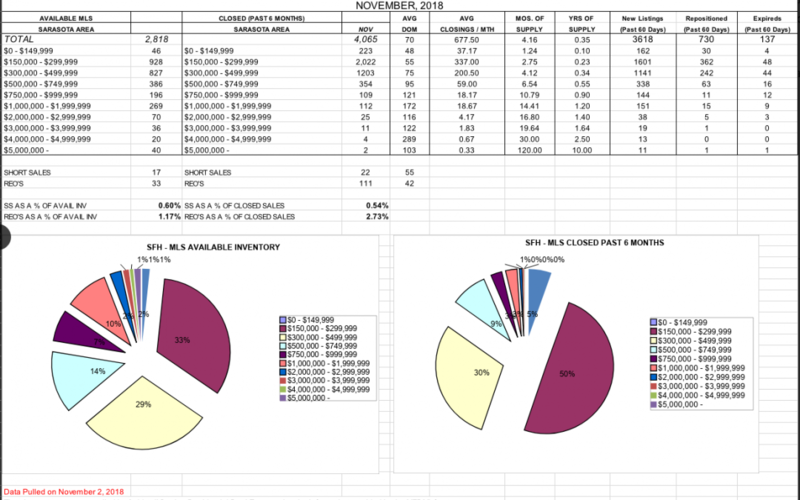 The most recent Inventory Reports for Sarasota and Manatee County were released this week. October Closings were up 9.3% year-over-year with 622 Closed units. Closed Average Sales Price was up 9.1% – indicating our region is holding appeal while other National markets are softening slightly in volume. October posted 347 new Pending Contracts (up 5.1% year-over-year) and 511 new Listings as Sellers position their homes for returning seasonal visitors. New developments throughout our area are busy with fall visitors and often have inventory houses for sale. It is interesting to note on the attached documents that there is a slight shift in the months of supply in several price categories. This is a good report to share on Listing or Price Repositioning meetings with Sellers! Positive economic indicators continue to align with the Consumer Conference Board reporting Consumer Confidence rose to 137.9 in October, the highest level since September 2000. Combined with 60-year low unemployment rates, our winter season should be busy and productive for everyone! For a copy of this most recent report, email me at Shayla@sarasotarealestatesold.com or call 941-544-7690!